The anticipated departure of Blackpool 280 occurred on the23rd March (Monday), following its loading and dispatch to its owners at Heaton Park, making its first contact with the tramway there on the 24th. 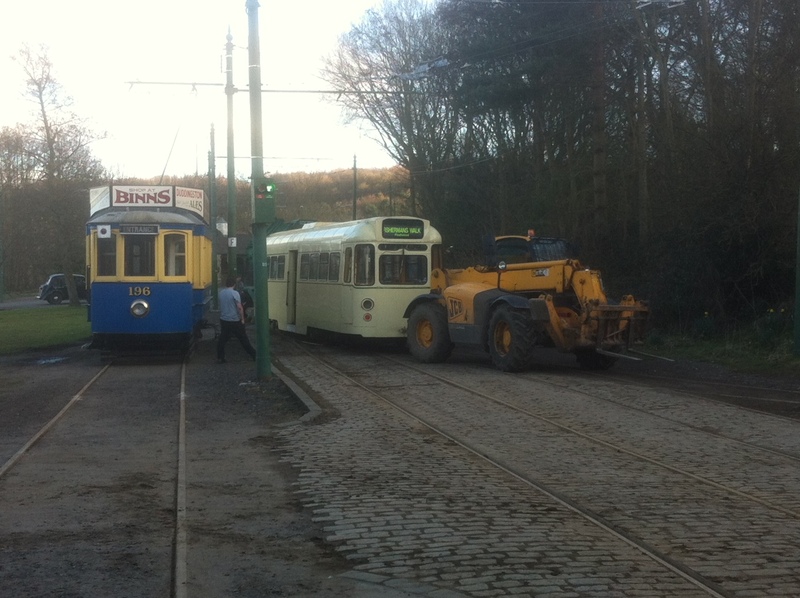 As part of the move, Gateshead 52 was removed from the storage area behind the Town and unloaded into the depot. It was initially placed on Road 3 so that a glance underneath would be possible, before shunting to the back of Road 1. It will soon move again, onto Road 5 – which as many will know, is not rail connected! 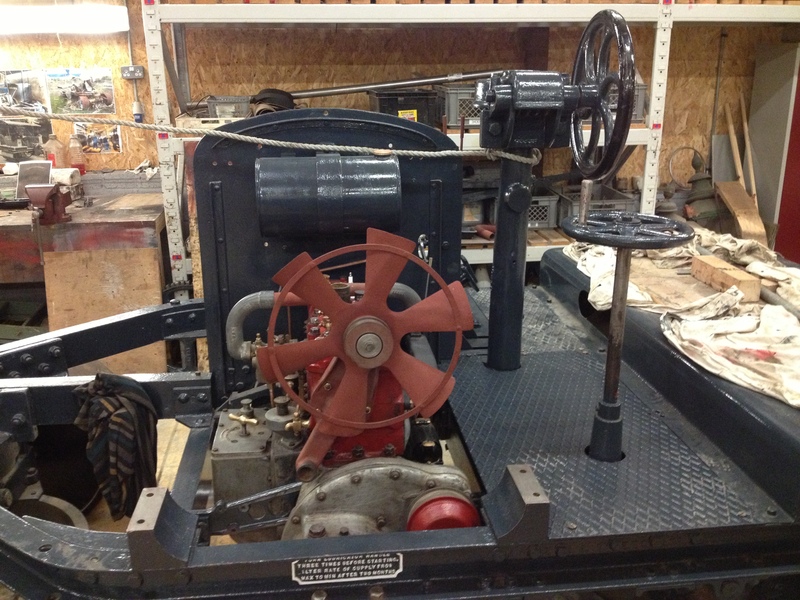 My preference for this is a sideways jaunt using traversing jacks. More of this in due course. Below: The first two photos were taken by Les Brunton and show 52 being loaded and then 280 being propelled towards Scott’s low-loader trailer for its own loading. 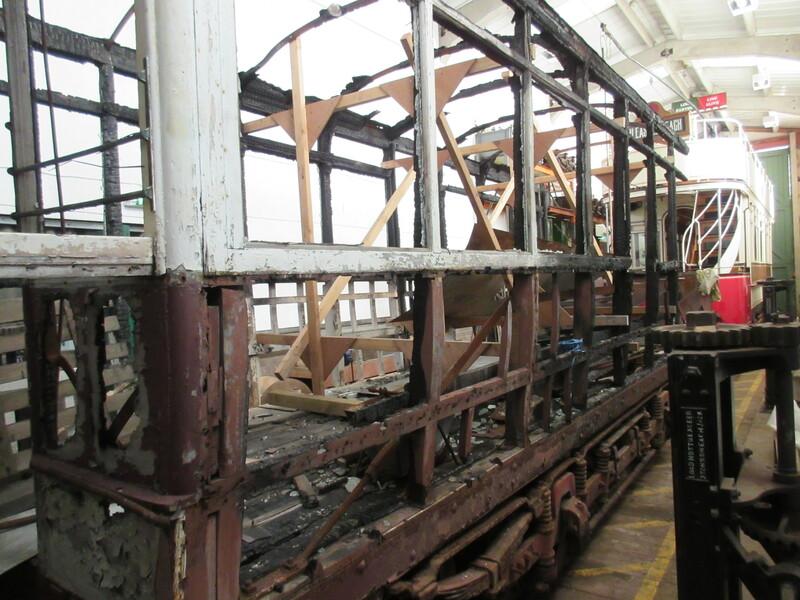 Below: With 52 inside and the tarpaulins removed, we now have the chance to begin assessing it for restoration. 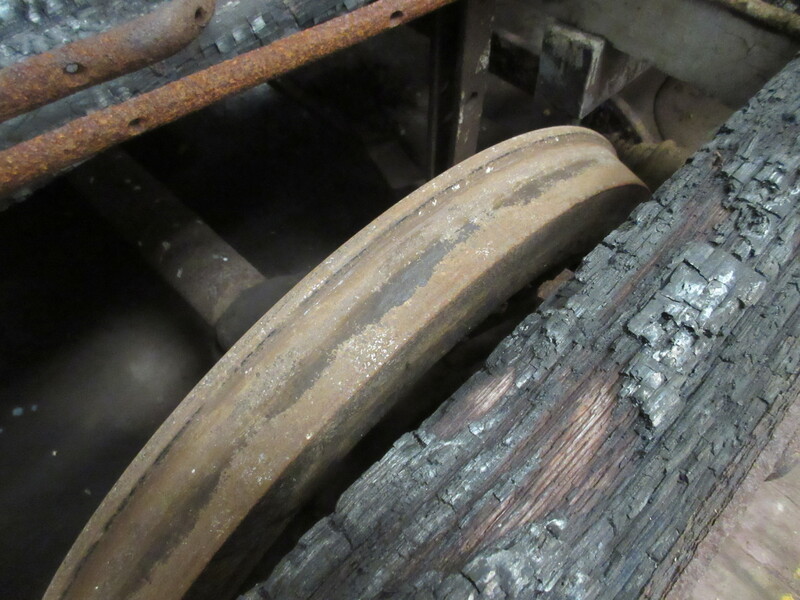 Below: One end and side certainly bore the brunt of the arson attack, as can clearly be seen here. 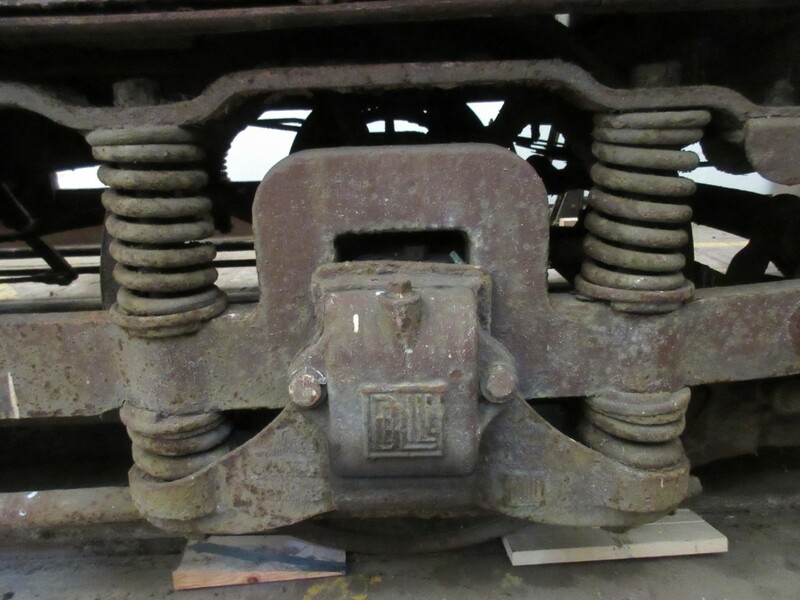 Below: One side and one end did however survive in sufficient form to enable them to act as patterns (and maybe supply some parts – charring at least protects against damp and rot!) for the reconstruction. Below: New tyres will be needed! 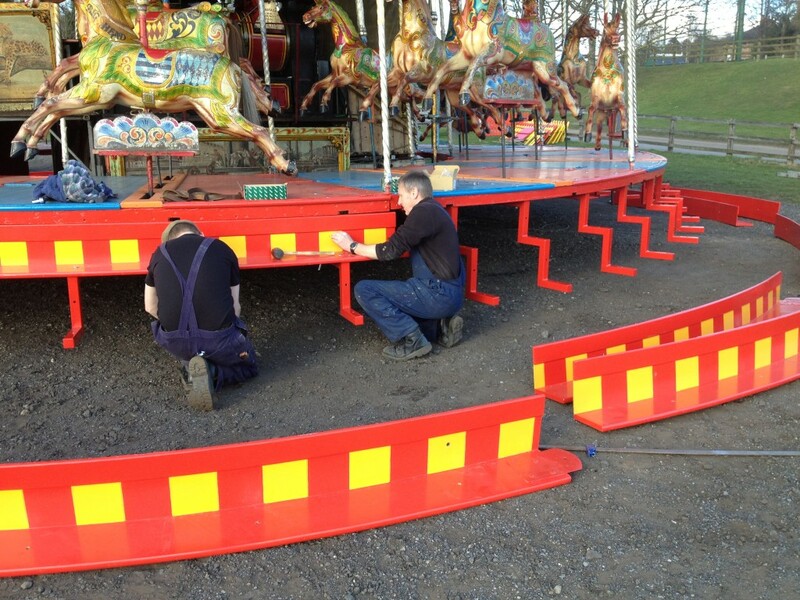 Below: Tony and Matt B are seen fitting the new steps and brackets to the Gallopers – the end of a long winter of work on these for them (which included painting them!). 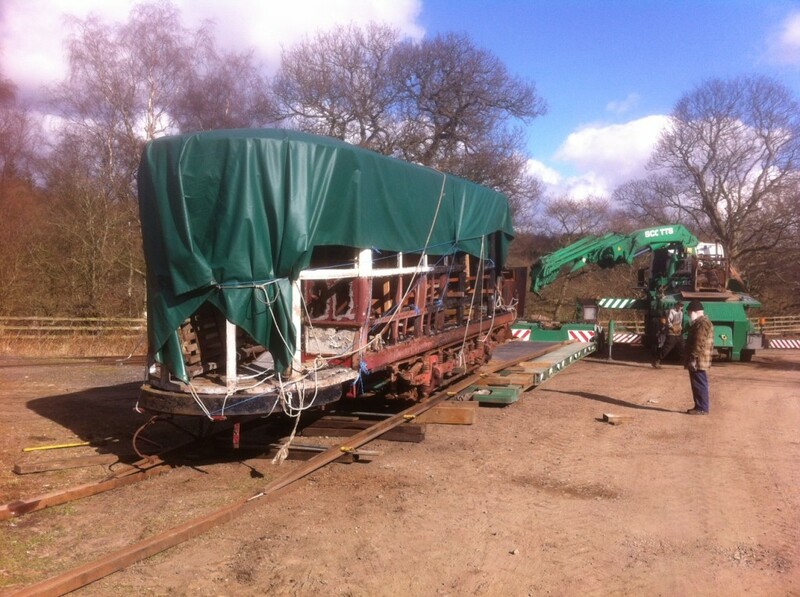 Below: After this, the pair set to on assembling the water tank for the narrow gauge railway (more on this later). 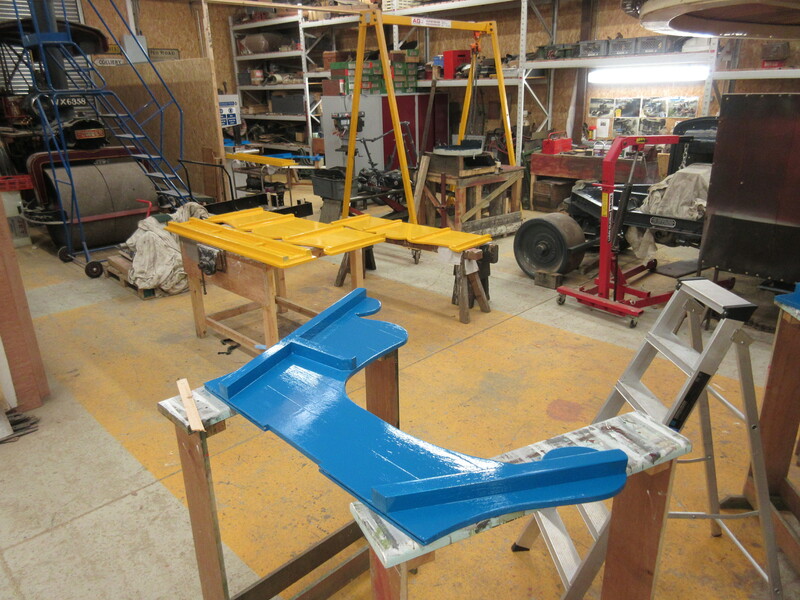 Below: The new chariots/sleighs for the Gallopers are seen in an advances state of completion here. Below: A last minute job for the pair was constructing a new bar for the beer tent, which was requested and completed in between my popping in between jobs, and will seen give pleasure to those seeking refreshment in the Pit Village area (though there was some concern it may be too big for the previous marquee and so an even bigger beer tent will be needed – for which no complaints are being received!!! 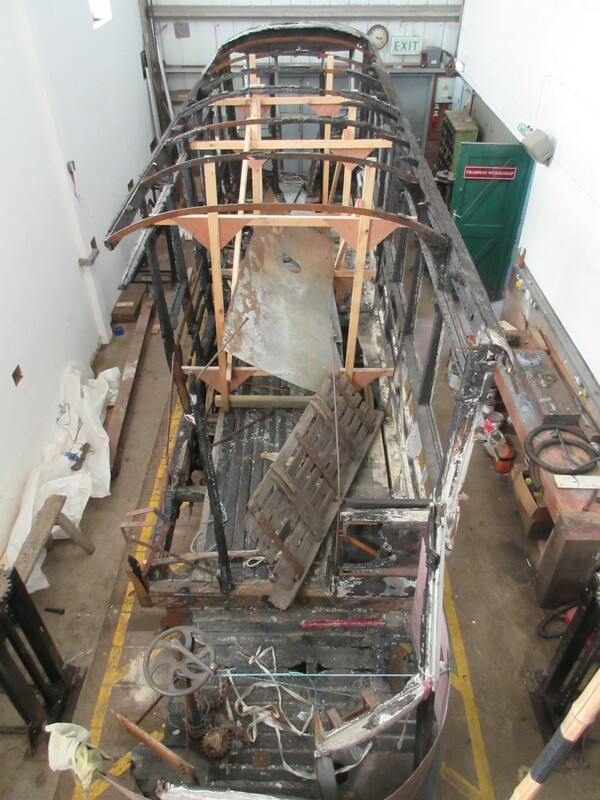 Below: A shot of 264’s lower deck, work on which is temporarily paused as the next coats of paint (and filler) need to be applied once it is settled back onto its truck. Note the new glazing. 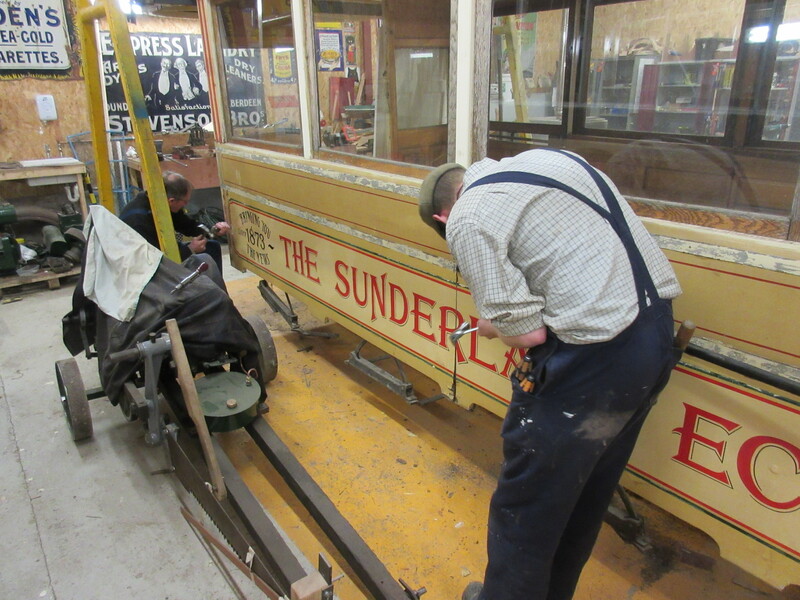 Below: Tony and Matt B continue to strip the top deck from 264, much of the panelling being in quite poor condition and so will all be replaced. The window glass has been laminated as well. 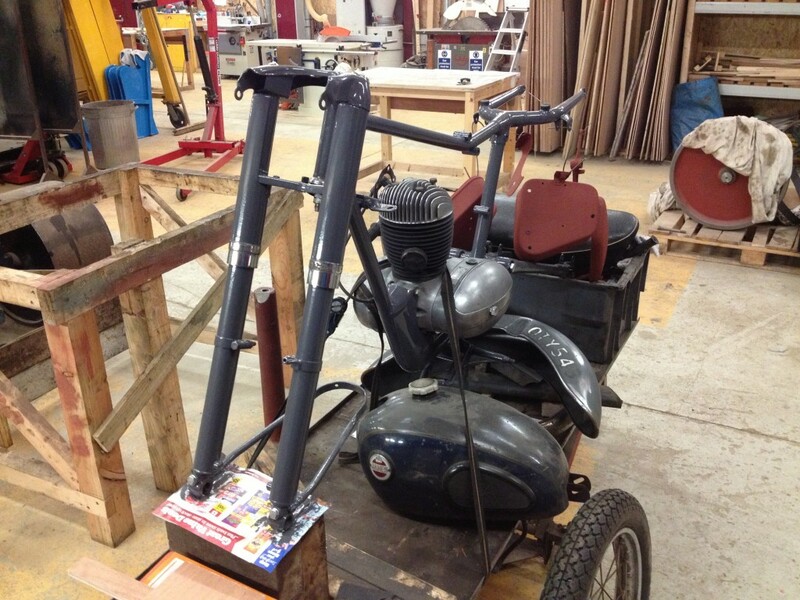 Below: The Friends team working on the James motorcycle are now into the reassembly stage, with the engine refitted as seen here. Below: Signs galore have been in production. Phil Anderson’s apprentice Sarah Jarman (a familiar name…!!!) 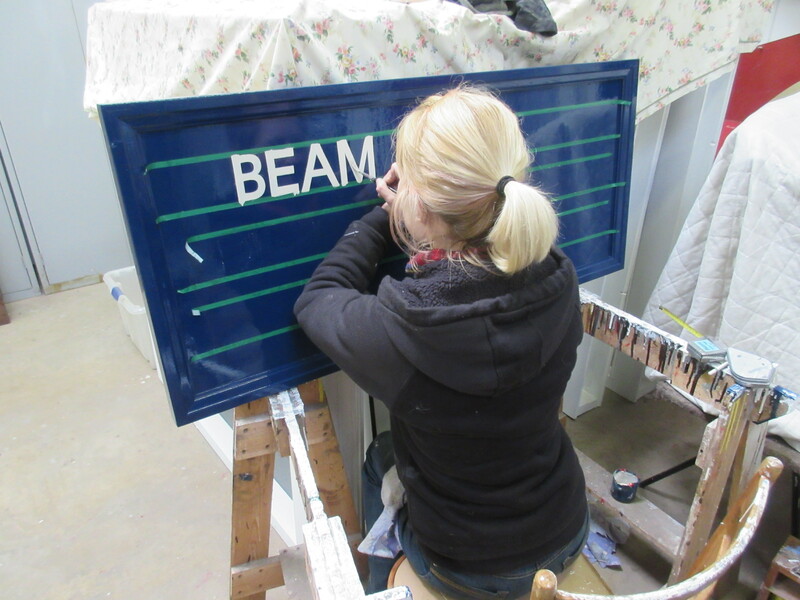 is seen signwriting the second board for the new RDC Depot. Below: One for the family archives! 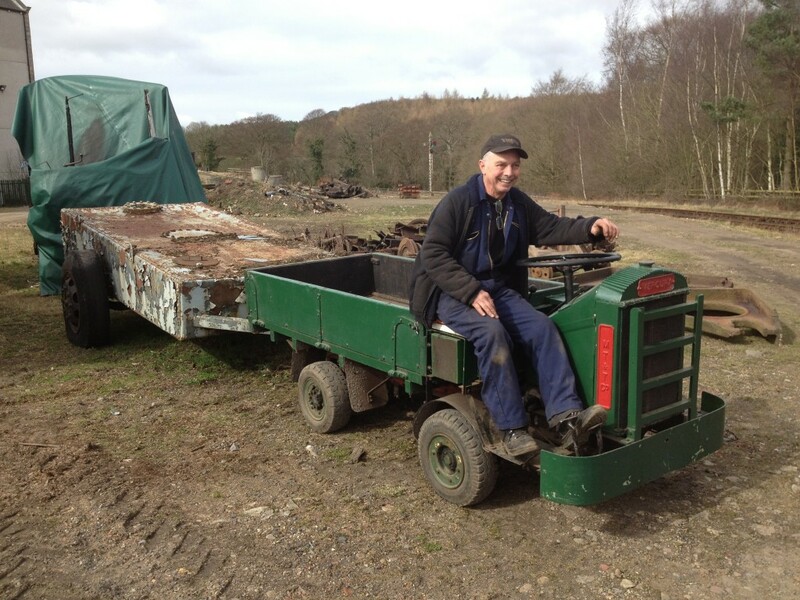 Brian, aboard ‘Freddie’ (the Mercury truck… get it?!!! ), seen towing the steam navvy’s water cart in order to liberate Gateshead 52 behind. An ambitious attempt but ultimately successful and Brian continued to smile as the steam evaporated from Freddie’s radiator! Below: Matt E and Dave G (we have multiples of Matts and Davids!) spent some time on Puffing Bully, repairing a leak to the tank and modifying the arrangement for attaching the tank to the chassis. 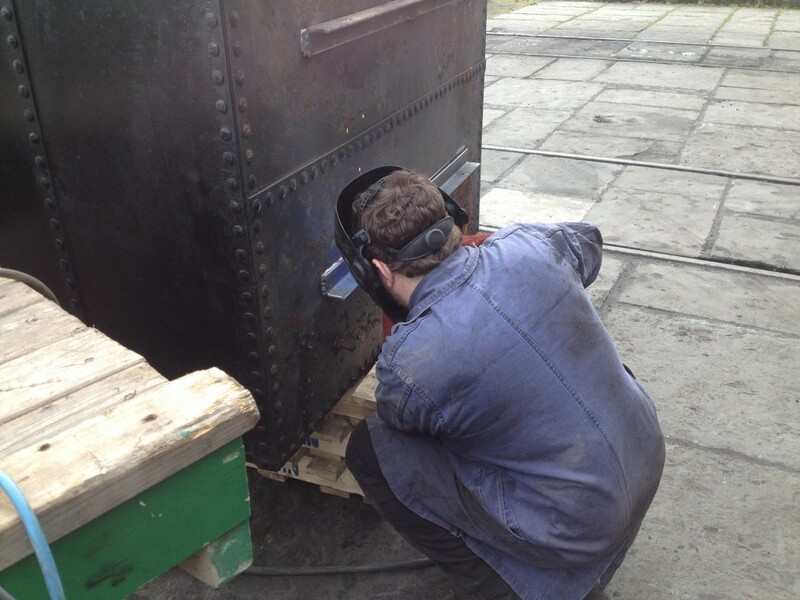 Matt is seen welding the new brackets which will enable the tank to be better secured to the chassis, whilst Dave excavates the bolts from the somewhat distorted tank support cross member. 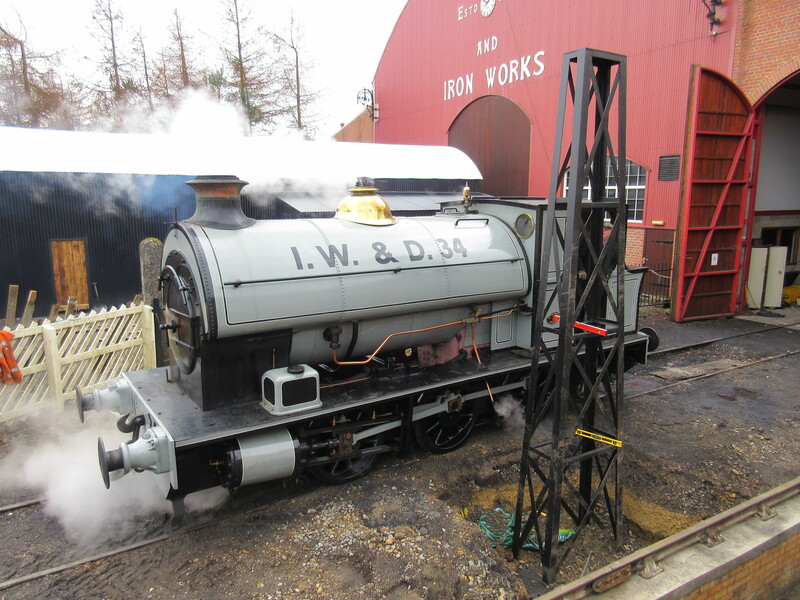 This engine has always had a deliberately ‘folksy’ appearance, but the ‘nodding’ and leaking tank were one step too far in this pursuit and are now cured (hopefully!) of these traits. 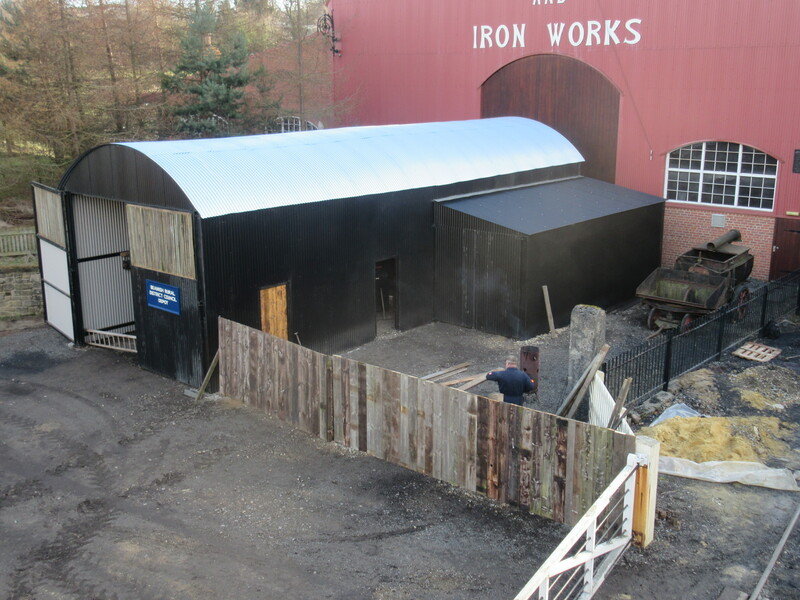 Below: The RDC Depot (Rural District Council) is nearing completion, with the erection of the boundary fence complete (and now replete with enamel signs) and numerous other jobs finished. 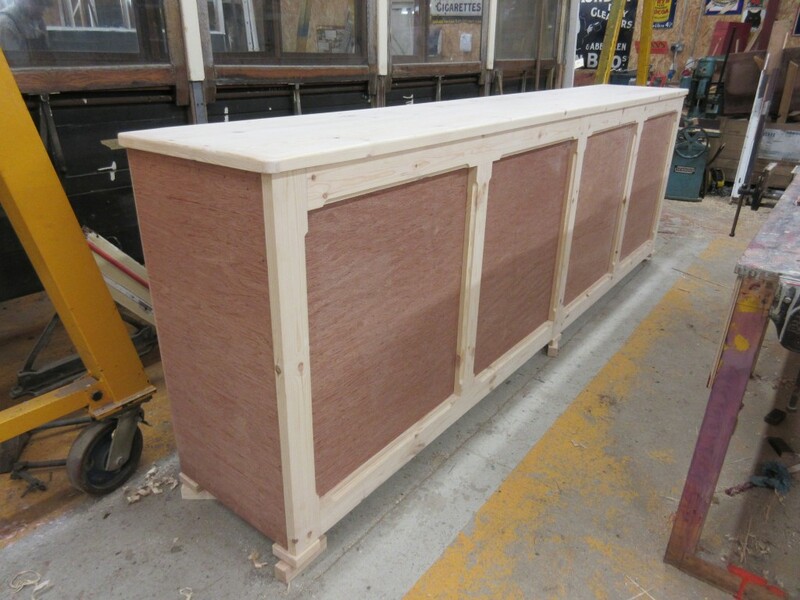 Some further detailing awaits, but it will be open by the GNSF, after which the final arrangement of exhibits will be put inside (it is to act as a store for the event as this enables us to spread out the arrivals of some exhibits). 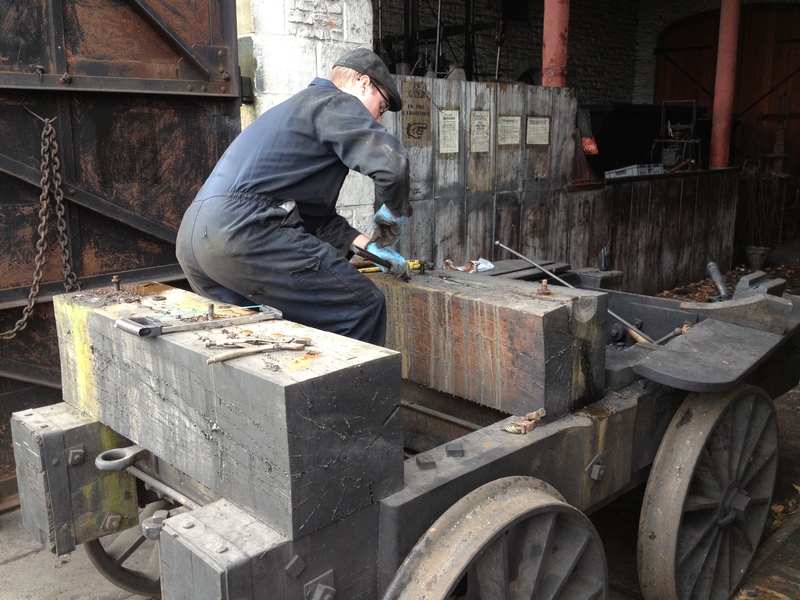 Below: Matt E and I put the water tank in place on the narrow gauge line, as a ‘cheering ourselves up when worn out’ exercise. It will be plumbed in next week. I think it looks rather good! 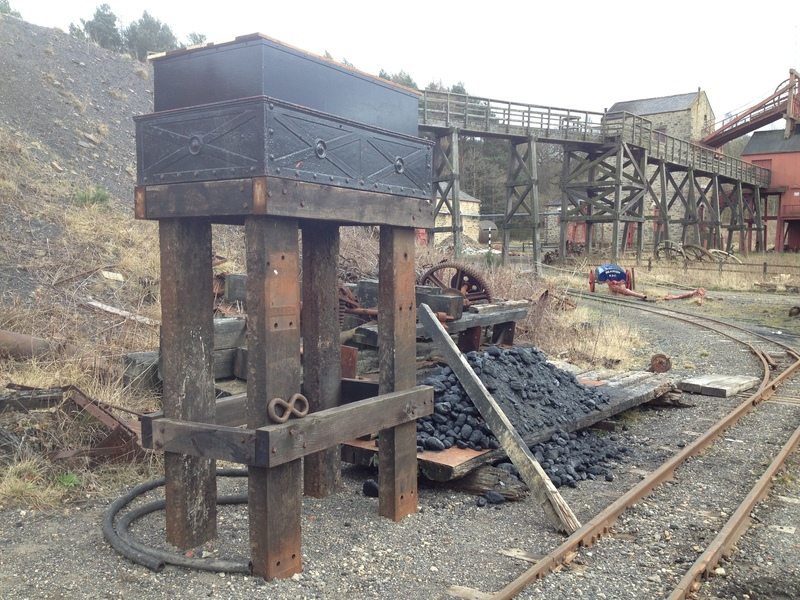 Note the relocated coaling ‘stage’ (assemblage of planks might be a more apt description). This area will be further enhanced with the spreading of ash and general filth as a display during the GNSF event. Below: We had originally intended to live with the signalbox steps, making repairs and applying new paint, but the rest of it looks so good that the contractor making windows for Ravensworth Terrace was prevailed upon to quickly turn around a new set of steps (which seem to weigh several tons! ), so we can complete the job to a consistent standard. 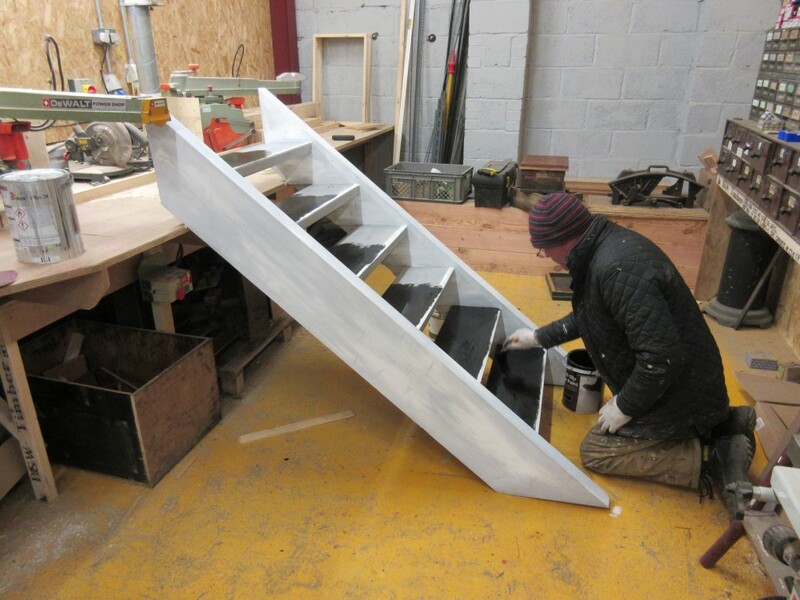 Gordon paints the step treads as a break from the intense heat and sunshine outside (it was pretty much snowing!). 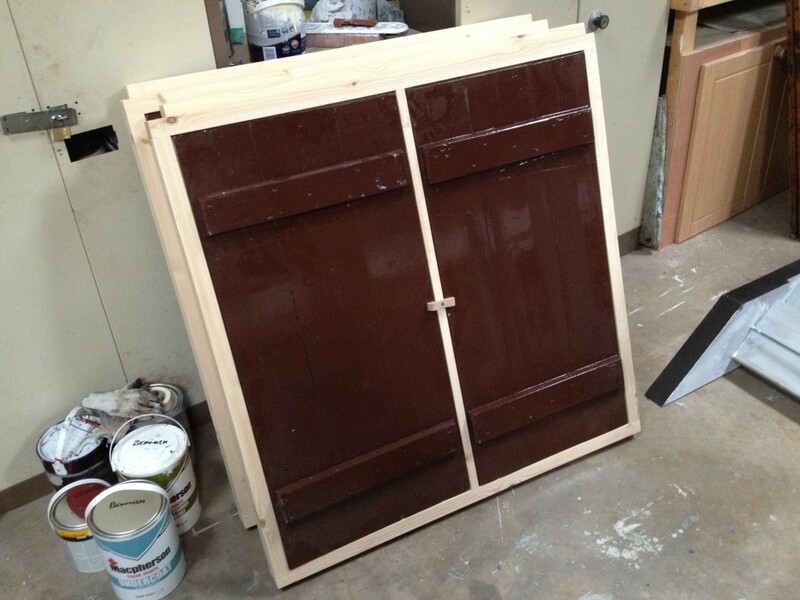 Below: The restored doors and new frames from the coal drops (ex West Boldon) at Rowley are in the Finishing Shop for final painting and will be refitted soon. The continual improvement of Rowley will continue for some time, as each job completed tends to see two more added to the list… I am conscious that we need to pay extra attention to our NER ‘jewel’ and make sure that the station area continues to develop as an accurate recreation, accepting that future motive power and one coach will not be of NER origin. More on this project (ongoing) in the future, but hopefully the fruits of this winter’s work will be visible soon, the signalbox refurbishment being the most noticeable. Below: Portbury was in steam during the week for crew training and competency exams. 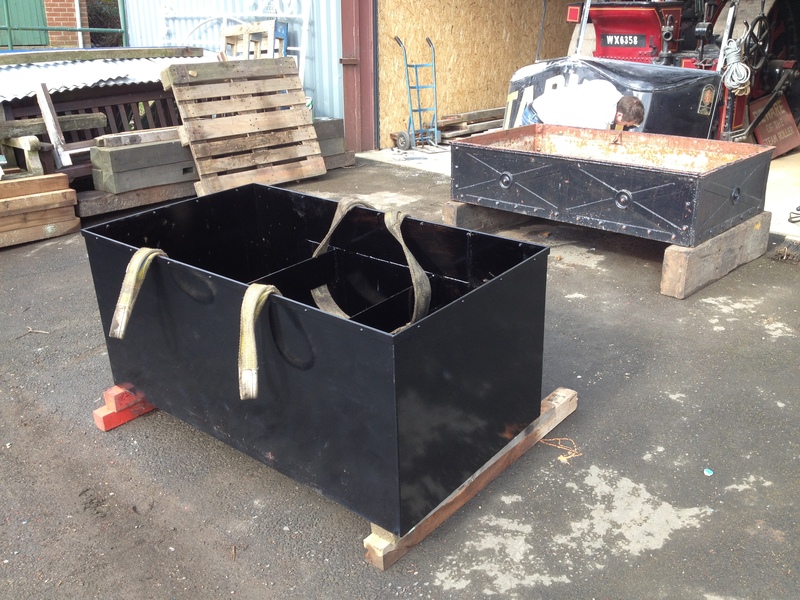 These photos show it alongside the new water tower gantry, which will support the pipework from the water tank and enable it to be delivered to both saddle and side tank locomotives as well as provide an auxiliary supply for watering ashpans and road steam engines. 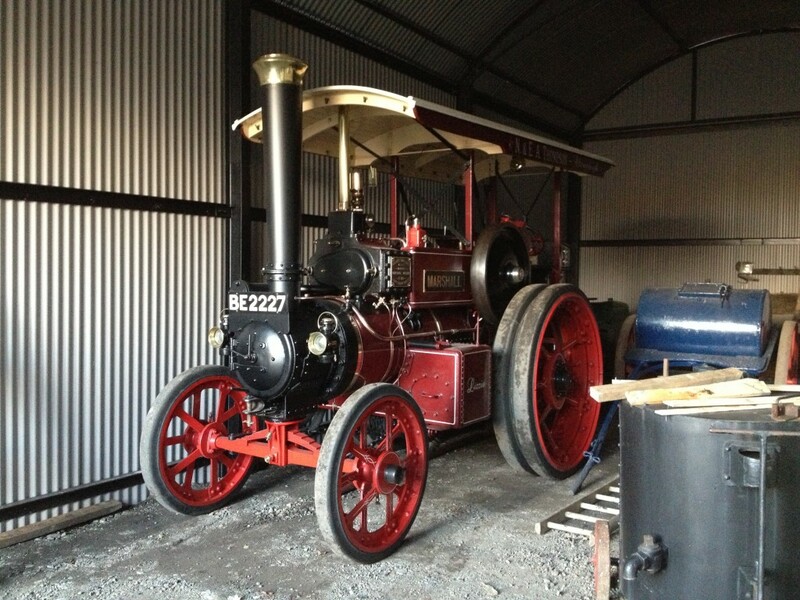 Below: Neil Thompson’s Marshall steam tractor has arrived and was placed inside the RDC Depot (see how useful the building already is?!). 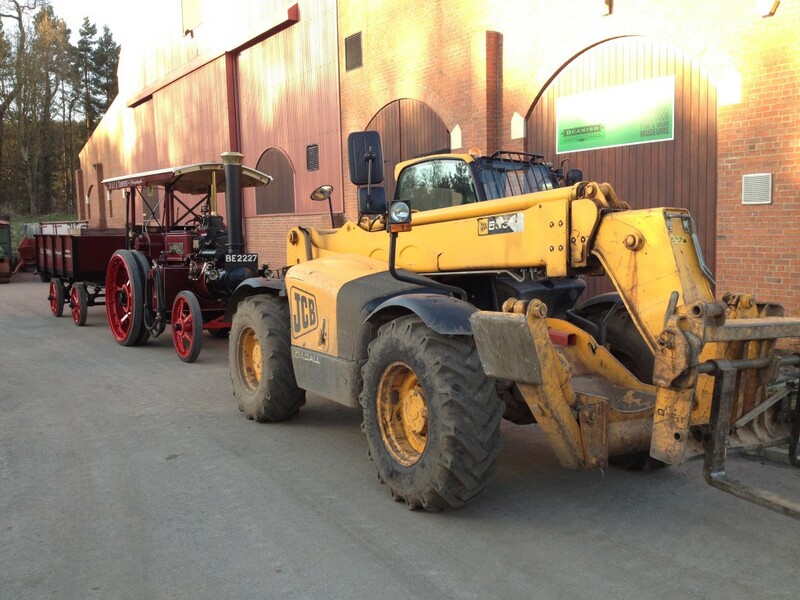 It is seen here as part of a more unusual convoy, headed by our invaluable and hard-working JCB tele-handler – an unsung hero of the Museum! 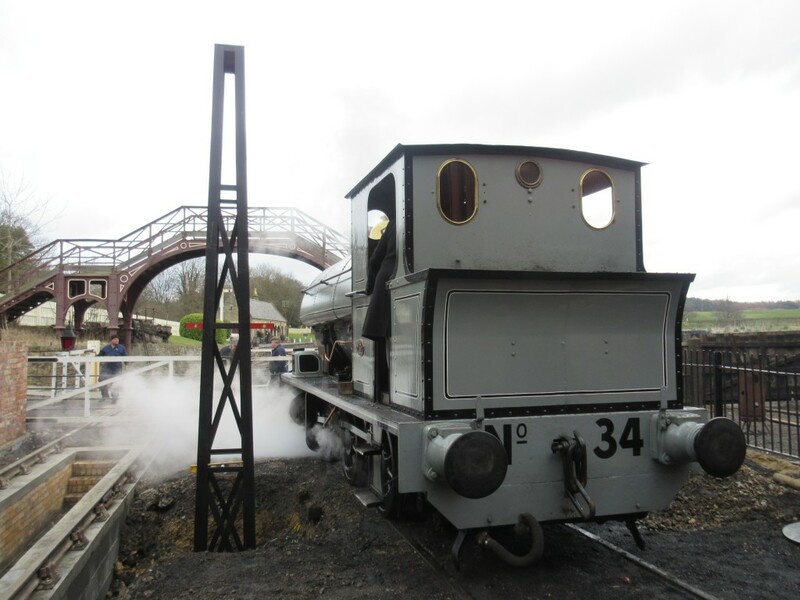 “It was originally supplied to the Ashover Light Railway which transports minerals from Ashover to Clay Cross in Derbyshire. It did not carry a name at that time. 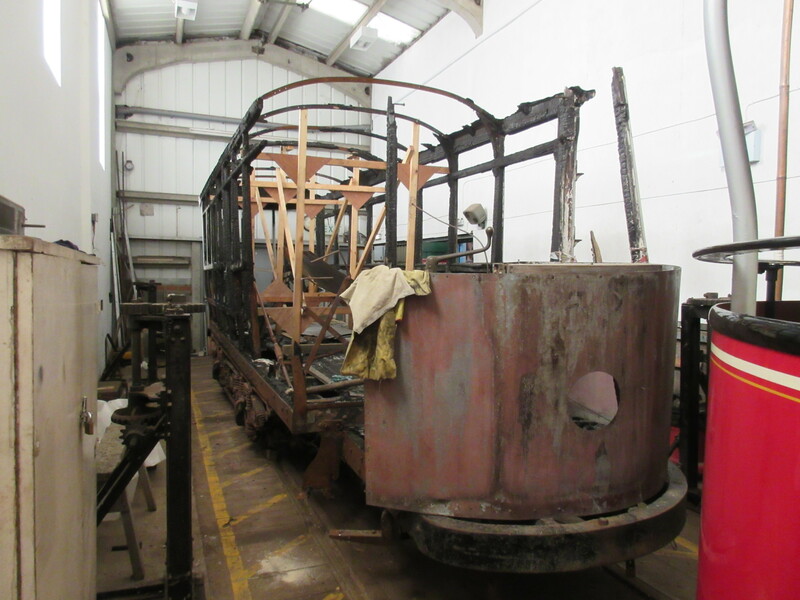 Ashover came to the FR in October 1981 from the East Anglian Transport Museum Society, Carlton Colville, Suffolk. 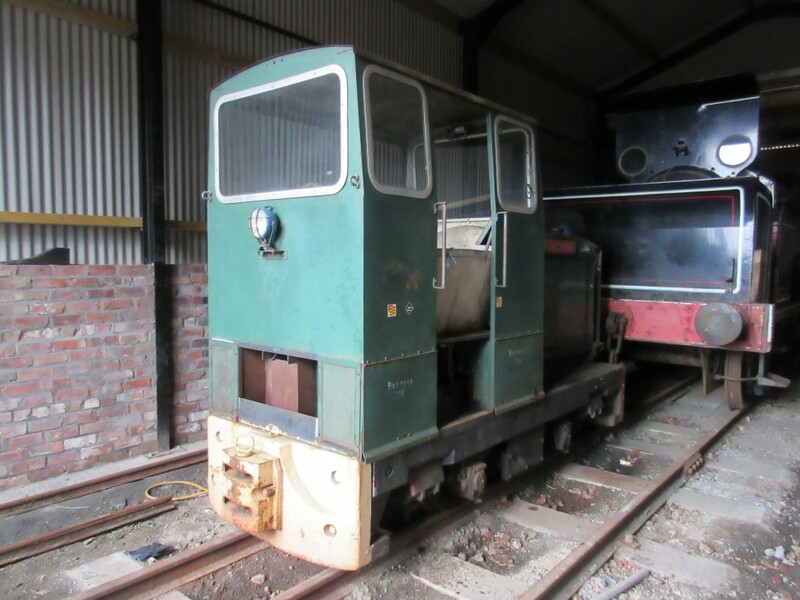 Ashover was commonly used as Boston Lodge works shunter, occasionally being used on Parks and Gardens works trains. 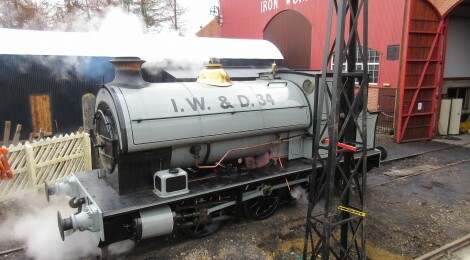 As of November 2012 it is at the National Railway Museum, York, for overhaul”. Ashover is now at Beamish for completion of the overhaul (for which one of the major components required is now on site) by volunteers. 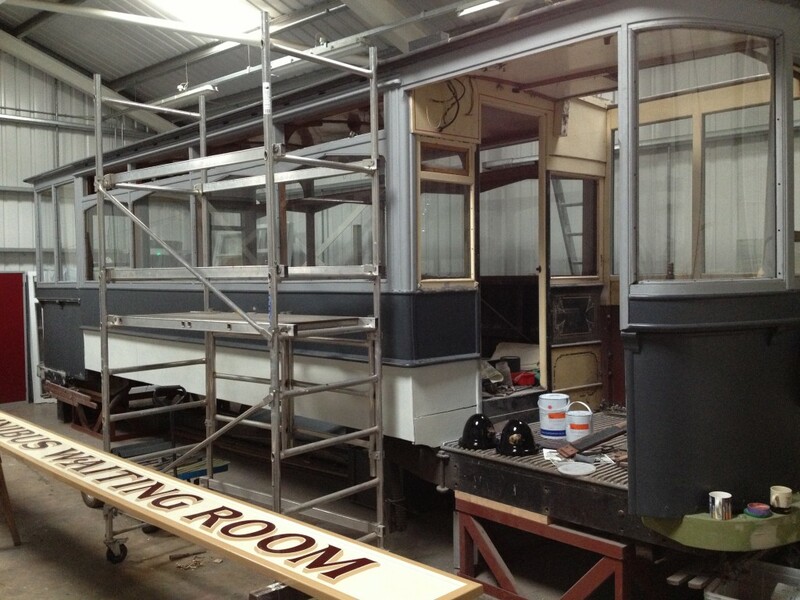 Below: The team restoring R025 have readied it for its GNSF appearance. 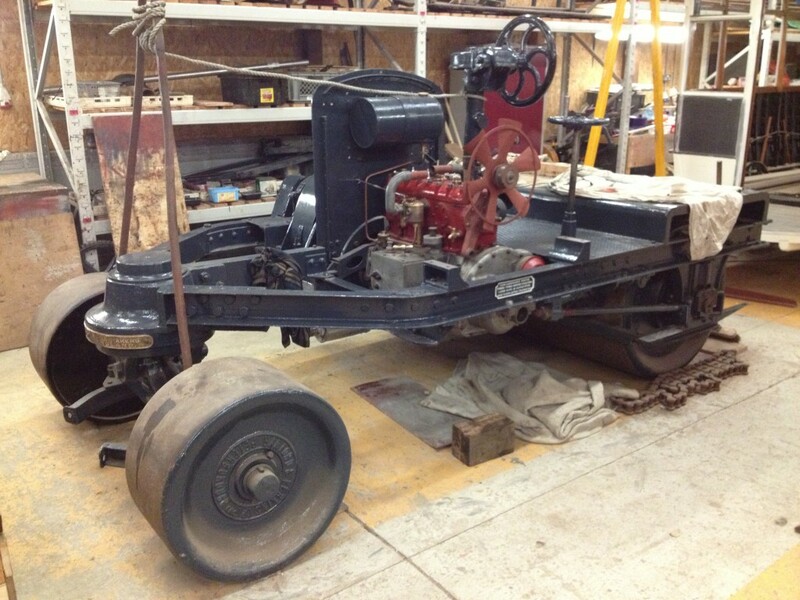 It will be static at this stage but will appear alongside numerous other rollers from this manufacture and I hope this will be a theme we can build over the years ahead. I hope to have a couple of my rollers there, and there are at least five others invited to the steam fair which can take their turn alongside the I’lson stone crushing team display on road construction/repairs on the evens field. 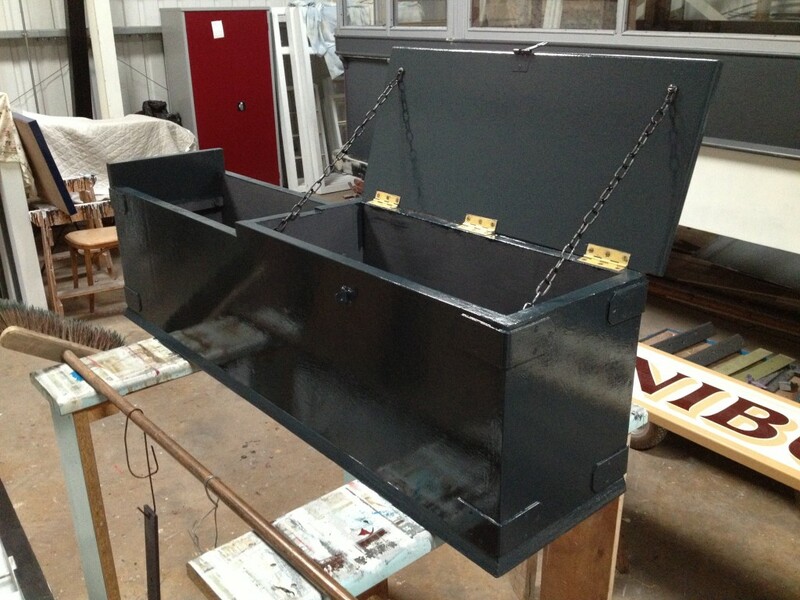 Below: The new seat/toolbox for R025 in the Finishing Shop where it is being readied for fitting, hopefully over the Easter weekend.